The difference between humans and Neanderthals is their height, size and morphological features. Neanderthals, when compared to humans, were shorter in height and smaller in size. Humans have larger bodies when compared to Neanderthals, and have a significant difference in form and structure, especially in their skulls and teeth. Another significant difference in the human and Neanderthal is their DNA. Fossil and archaeological evidence prove a distinct separation between Neanderthals and the modern Homo sapiens. Neanderthals were a different species to humans. The brain of a Neanderthal had a raised larynx, and was also bigger than that of the Homo sapiens. There are notable physical differences between humans and Neanderthals, such as the Neanderthal has thicker bones, shorter limbs, an asymmetrical humerus, barrel chest and thicker metacarpals. Neanderthal developmental differences from humans are the Craniodental development. Neanderthal and human faces and dental differences starts right from pre birth. The human and Neanderthal occurrence in time also signifies a difference in both species. Neanderthals, when compared to humans, were much stronger, and they lived in the cold climate of Europe. Neanderthals were homogeneous species, and they are not human ancestors. Although, the difference between humans and Neanderthals when compared to apes is small. Neanderthals had a small population in the relatively recent past, and have no genetic or evolutionary connections with humans. Neanderthals displayed limited genetic diversity due to the lack of clear hybrids in the fossil record, and the lack of Neanderthal features in modern humans. Their limited genetic diversity suggests they went extinct, leaving no descendants. Their Homo erectus development is also more similar to that of apes rather than the modern human. The human child’s growth rate is slower than that of the Neanderthal child, as they used to grow rapidly from infants to adults. Humans share similarities with other animals, such as anatomical, physiological and biochemical aspects. As humans are made from pre-existing material, as said by the bible, humans have much similarity within their basic body plan, the way it works and the underlying chemical pathway and machines in the body. They are almost the same as other mammals such as Neanderthals and other primates. Some of the significant differences between the human and Neanderthal are the distinctive sizes of their brain, bipedalism, decreased size of back teeth and advanced culture. 1. Human and Neanderthal brains and body structures have major differences in height and size. 2. Neanderthals are not ancestors of humans, but a homogenous species. 3. Humans have developed better eyesight, hearing or smell than Neanderthals due to skeletal adaptations. 4. Neanderthals and humans have many difference in their DNA. 5. Humans and Neanderthals seem not to have major differences in their behavior, and as well as cultural abilities, but Neanderthals fossil brains differ from the modern human brain. Jilani. "Difference Between Human and Neanderthal." DifferenceBetween.net. April 14, 2010 < http://www.differencebetween.net/science/difference-between-human-and-neanderthal/ >. This needs to be updated, I believe that it was recently reported on the news that Neaderthal genes have recently been found in some human DNA. Could you check on this? You are exactly right. Harvard Professionals on Genetic Studies have now concluded that Neanderthal did live on in everybody except Native Africans so the differences as stated above in Neanderthal man not looking at all like Modern day humans must be complete crap. This poster had better go back to school to learn what has recenttly been found which will certainly call into question wht this poster claims there is absolutelt no comparison between Homo Sapien (us) and Neanderthal. Not sure who wrote this article but I am sure it is time for that person to retire from commenting or get a real degree or at minimum get a refresher course so he can know what has been recently going on while they was doing other things like sleeping their life away. As soon as I read , “As humans are made from pre-existing material, as said by the bible…” I knew there would be falsehoods in the article. Agree. When the bible was used as a primary source, which is unproven, the authors credibility was lost. 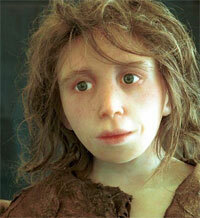 s/Europeans did breed with the neanderthals???? What is unproven about the Bible? If there Is a better primary source of knoweldge in the entire universe, I’ve never known it. The Bible knows no equal among books or stories or lessons. You are wise to accept its teachings and travel a path of enlightenment. I pray for you, my sister, to Jesus, son of the almighty God. That you might know Him in an exceptional way and see that all that is in Him is good. And all that is YOU is in HIM. Your comment is very interesting. You were looking for an update. In doing that it would help if you could recall where & when it was reported that Neaderthal genes have recently been found in some human DNA. You are the only one who has the source of that information. Google and other search engines are terrific. Give us some kind of clue, like time, TV networks you watch, and any biases that might have influenced your opinion. I am interested and willing to help . What s/he said is true, you are the one who is not up to date. Just ask anyone in the business. I have read the same information. Modern day humans from europe and asia have 1-2 percent of the Neandetthal DNA. Africans have none. Nomadic homosapiens happenstanced with Neanderthalsin in modern.day France and the common belief is that this was the beginning of the end of that species of human. Perhaps some opportunistic interracial mating occured and bore half breed offspring. I had DNA testing done about 5 years ago with 23&me. I am found to have 3.2% Neanderthal DNA. In my way of thinking, it answers alot of questions for me personally. I am offended by the writer suggesting that Neanderthal were not human. Current reports states that Neanderthals gave us additional height of approx 0.1 inch. Not less. I infact have an unusually high number of Neanderthal variants in my DNA- within the 87th percentile. I know many others have variants to some degree as well. Yup! I’m in the 94th percentile for Neanderthal genetics. The species lives on in me. So u looks like an appe ? I believe these Neanderthal are just humans that lived to be very old. The Earth was different back then, nobody knows the conditions for sure. had a small percent of neaderthal gene. Would you please enlighten everybody here exactly which material man is not made of from here?? Man is made from elements found here on Planet Earth as is taught in every school everywhere except for the one you went or did not attend. My genious can you please inform all known scientists and Physics Proffesors exactly where they went wrong? I would love to know how far you went in school or if you even attended school whatsoever as the fact we are made from elements here on Earth is taught in every Middle School across America. There is even a poem that is taught that lists every element found in man. Perhaps you have not yet come out of the caves as your remark displays that mental capacity. Since you know more than all of the scientists and medical and mineralogists around the world can you please tell us which one is not found here on Earth? Hah. @ralph you are an utter scatter brain. It seems as if you are the one still living under a rock. Here Stevens is making a social commentary on house the author of this article uses a work of historical fiction as solid evidence. The fact that you missed that is ridiculous. It’s so obvious and yet you didn’t see it. This article is really outdated. Two modern chimps of the same species will have more DNA variation than Neanderthals or Denisovans have to modern humans. And yes, Neanderthals and modern humans did interbreed. It sounds like the words in this article like “significant”, “major” and “prove” are used to compensate for weak evidence that has now been shown to be false–NOT very scientific. Thats guess work…interbreeding creates hybrids. So basically whites ppl are not human ctfu ..
Are you the author of this article? Clearly we all came from the same source, even neanderthal (just much earlier). The small amount of admixture that did occur (while kind of cool I think, to know an ancient branch of humanity live on through) does not make us not human. I would be very careful, if I were you (and I’m not), about declaring the presence or absence of the humanity of any given population, given the company that puts you in. It serves no useful purpose, other than to inflame already simmering tensions (unless that is your goal), and does not lead to mutual respect and understanding. You become the problem. If you want to know Truth, conduct your own investigation. Your history teacher is not allowed to teach his/her opinion, sadly that is not how U.S. school system works. He cannot afford to lose his job. What has the stupid bible to do with evolution biology? Sorry, is this stupid for you: “Children, obey your parents in the Lord: for this is right. Honour thy father and mother; (which is the first commandment with promise;) That it may be well with thee, and thou mayest live long on the earth. Maybe you haven’t really read the Bible yet. In this day and age there is no excuse for naivete and religious ignorance. What on earth does that bible quote have to do with science and evolution? OK you chose the wrong Bible extract to make your point all this shows is people in power want lesser people to understand thier place and obey them lol. Evolution theory has no proof. It’s a theory nothing more. There are Zero fossils found on the whole planet that link monkeys to humans. It’s junk info made up by people who don’t want you to believe ancient documents that have been found stating otherwise. Are whites the real humans? I think they are the real neanderthals, given their bigger heads thus bigger brains and their intellectual superiority. I understand neanderthals used tools that time. You are puzzled because I acknowledged the intellectual superiority of Whites, which made you happy while linking it to the Neanderthals, the intelligent specie which used tools already those days, made you unhappy. I don’t understand “The brain of a Neanderthal had a raised larynx, and was also bigger than that of the Homo sapiens.”. The larynx is a structure in the throat, has nothing to with the brain. The larynx area is rounded and dropped in us today. The Neanderthals had a flat space and the larynx never dropped so speech as we know it wouldn’t have been possible because there wasn’t enough space to vibrate and make vowel sounds. Greg Bradon brought up all this stuff from his new book, saying that we interbred w Neanderthals, but did not descend from them or Apes. We just ‘appeared’ 200 thousand years ago. First, this article is littered with falsehoods e.g. larger brains. Second, interesting that some commenters are “proud” of being Neanderthals. Why do you think they dwindled as humans multiplied? Hate, for one. They are the only ones who deny and abandon their children. They say a child of a “black” and a “white” parent is black. How? Clolor? Genes? Neanderthals have shorter limbs, and barrel torsos. Their are still here today but they just call themselves white. No offence but all non-africans have some Neanderthal genes, though not all “whites” are Neanderthal in looks or behaviour. Sometimes, their Neanderthal gene is not the dominant one. Sometimes those genes have been replaced by genes from humans. Another reason for human dominance is cooking of meat. BTW Africans are the only race who don’t distinguish fellow Africans from other people, but accept everyone. Such acceptance is alien to the Neanderthal who won’t even accept those who are half their race as being half their race. Well said… I think these people are just trying to muster up importance and self esteem… the lie of white pride has kept them in denial about their own true nature for far too long. They are also the ones who brought sickness and disease to the melanated people everywhere else and tend to be subject to various illnesses, sicknesses and diseases now…. but in an attempt to level the playing field they now try to make everyone else sterile and sickly, slowly and methodically..
YESS! you took the words right out of my mouth! Thank you sis. This was the ultimate read. Some great genetics coming from homosapiens there. So thanks for that. Also, you should know that there is absolutely no scientific or historical evidence of Neanderthal behavior beyond tool making and being omnivorous (just like homosapiens). As in there’s no telling if they were peaceful, or aggressive brutes… how ever, there’s lots of evidence for homosapiens being murderers, rapists, misogynists, genocidists, and racists. So I’d hazard a guess that, that has nothing to do with the relatively low percentage of neanderthal genetics predominantly present in European and asian descendant people. Well stated.& Thanks you very. Much. Your generalizations are fantastic. Does attempted genocide equate to acceptance in your mind? Fellow Africans have caused mass genicide against other Africans because they distinguish themselves as different, your comment is confusing. This article can’t be taken seriously. It’s an outdated notion of Neanderthals. Many of us have Neanderthal DNA and they were very close to us. They were probably smarter than we previously believed. I also can’t take any article about evolution that mentions the Bible seriously. A great deal of inaccurate twaddle thrown in among the factual information. Let’s leave science to science and religion to religion. Neandertalers are NOT another species! BY DEFINITION, different species cannot interbreed and produce fertile offspring. The fact that Neandertal genes are found mixed in the human genome establishes incontrovertibly that they are, despite their nomenclature, the same species – thus revision is needed, to Homo Sapiens Neandertalensis. Also, what gives with citing the Bible? The Bible is not a scientific treatise. Many of the statements made in this post, or whatever it is, are incorrect or opinion, not fact. There is no way to tell anything conclusive about Neandertaler behavior other than the common use of tools and survival behaviors. And what is this other twaddle about “evil whites” by some commentors? Given the disproportionate crime rates among blacks world wide, the very notion falls into the category of religion. Is this site a favorite of fantasists? This article is ludicrous. Homo sapiens Neanderthalensis WAS human, and all Europeans and Asians carry from 1 to 5% of Neanderthal genes. There is no way that this could happen other than that H. Neanderthalensis was closely related to H. sapiens sapiens; the same species, just a different variety of human. H. Neanderthalensis was ambush hunter who made spears with flint tips, clothed himself in animal skins, perhaps sewn together. He had to live in the frigid forests of the middle east and Europe during the Ice Age and therefore developed sophisticated survival techniques, requiring intelligence and inventiveness. He may have used fire. He buried his dead, perhaps with ceremony. My guess is that his disappearance was because he was overwhelmed by demographically but not necessarily intellectually superior humans (H. sapiens sapiens) as the climate warmed; there were probably never very many Neanderthals just as there have never been very many Polar Eskimos, the climate being so harsh as to prevent any large-scale population. Certainly the two varieties of humans interbred. There is no question about that; the human genome project has proved that not only did modern man interbreed with H. Neanderthalensis, but also with another variety of human known as Denisovan. I agree Neanderthal inbred with homo sapiens. and also fossil evidence has shown their village s were too far apart may be another reason why they became extinct. DNA evidence is changing the opinion of scientist like never before. From the above description, it looks like the Neanderthals was the stronger specie, the reason why they extinct is beyond us, can the researcher find out for us.